Inception, apart from being the most over-rated movie of last year, featured Edith Piaf’s anthem Non, je ne regrette rien on the soundtrack. Now I learn her song is the most requested by celebrities in BBC Radio’s long-running interview-record programme Desert Island Discs. 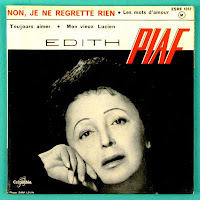 For non-French speakers I assume that it’s the title alone – and, of course, Piaf’s passionate rendition – that strikes such a deep chord. Yet while appreciating the Little Sparrow’s gutsy performance, what I believed were the sentiments of the song have always left me cold. Rather than a completely literal translation, let’s read the English title as “No, I’m not sorry for anything.” Can you really say that; would you want to? I know I can’t – and I don’t. I read somewhere regret is a wasted emotion. I’ve never believed that. You might as well argue that grief or guilt is negative – and therefore pointless. What a super-egotist you would have to be if like me, for example, you had lost both parents and been through a divorce and emerged without any scars. Even in that irritating celebration of boorish self-satisfaction My Way, Frank Sinatra admits to some regrets even if they are too few to mention. There’s nothing wrong with regret or unhappiness for that matter, as long as they are a spur to action and not a permanent condition. Perhaps the power of Piaf’s song owes to the fact it is in French. It allows us anglophones to focus on “Non, je ne regrette rien” and make up the meaning of the rest of the lyrics for ourselves. So rather than being the song of defiance I had taken it to be, it is one of hope.